Vermont Kosher specializes in beautifully prepared and presented cuisine that just happens to be strictly Kosher, and certified by Chabad of Vermont: Rabbi Y. Raskin. Our menus are created with a view to the best combinations of taste and presentation, utilizing the best of seasonal offerings from local organic farms whenever possible. Our catering includes business luncheons, parties, weddings and events. As well, we regularly serve organizations such as UVM Hillel, Chabad of Vermont, Jewish Communities of Vermont, the UVM Medical School, and JCOGS in Stowe. Touring groups and Shabbos guests to our area are generally thrilled to find us! ​and you might not find yourself hungry in Vermont! Please take a few moments and click around, we’re waiting to hear from you. Find them at these locations ​at the University of Vermont. ​dinner is served from our kitchen at Simpson Hall / UVM. 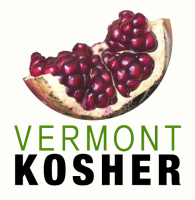 Vermont Kosher is an approved caterer for all UVM Departments. Vermont Kosher is ready for your event or function. Use our CONTACT FORM to let us know how we can help.